The long awaited visit of the Elective Home Education Officer! I was a little anxious about today, the LEA were sending their Elective Home Education Officer, Mr Moran, to check that we were ok to home educate and so arranged for Merry and her girls to spend the day at our house for moral support! Really not necessary! The morning started with using natural items such as nettles, berries, walnut shells, red and white onion skins to die rectangles of material using tie dying techniques (thanks to Merry for donating an unwanted blind!). So, we got started….firstly boiling the material in pans of vinegar and water and salt and water to assist in the dying process. Little did I know my house would smell of vinegar…this was left to bubble for an hour. We then had to drain and rinse the material in cool water. We had 5 pans of water on the go; one with walnut shells, another contained unidentified red berries, two separate pans of red and white onion skins and finally the nettles. OH MY GOODNESS – after 10 minutes of bubbling my house started to smell of fish!!…………. I know!! !………… Would you believe nettles could smell so strongly of FISH! Being vegetarian, was not a smell that I was entirely comfortable with but, thanks to the last of my scented candles, seemed to eliminate any lingering smell (just in time for the arrival of Trevor, the EHE Officer). The girls used marbles and rubber bands to produce a tie-dye effect on the material and then added to each of the pans. The results of the dyed fabric were fantastic! The best one being the red onion skins. It is our intention to make a wall hanging with the 12 fabric tiles. This is a job for Nana, the girls and a sewing machine! Trevor arrived just before 2pm……..what a lovely, lovely man! I had nothing to fear! He introduced himself and then checked to see if he could take of his coat…yes, he was serious! He explained that he wanted to have a chat about why we chose to HE , our resources etc so he could compile a report. Whilst chatting, Merry was initially in the ‘background’ stirring the ‘witches brew’ but within minutes was offering to have the babies of this man!! – I did, for the record, (or should I say, for the report) point out that it was not me who had said that! Both Merry and I were very impressed with him – he was understanding, sympathetic, encouraging and overall a very, very nice man! He had a chat with all the girls, and was not at all intimidating or scary. He commented on how impressed he was with Skye and Poppy, that they were lovely girls (which I already know but its nice to hear it from someone else!). He was amazed at the standard of their handwriting, artwork and content of work from being HE’d for such a short time. So after an hour and 20 minutes of a very relaxed and comfortable meeting, Trevor left until next year – I do hope it is him again! I was proud of myself and my girls….Merry said I handled it well and that made me feel better too. Thank you Merry for your support – I hope to return the favour one day. Once Merry and the girls had left, we rushed out of the house for Poppy to have her first proper horse riding lesson – she has been SO excited! We arrived and Poppy was allocated her horse, Pickles, who was a lovely dark brown pony. There are only 3 other children in the class, which is great for Poppy! Andrea, her instructor, showed her how to hold the reins, trot, walk over little jumps (logs on the floor). I don’t think she stopped smiling from the moment she put on her riding hat until she went to bed! Today started with a Poppy and I watching Stardust before getting out of bed, whilst Skye spent time on Animal Crossing!! Both girls did a bit of Education City and Grid Club along with work book Science looking at food chains…working out who or what is a consumer and producer. They were especially keen to get busy as we were going to town so they could have a hair cut! The afternoon was spent reading and putting together a skeleton that they has printed off the internet and we had fun finding out the names of some of the bones. Also looked at the Usborne See Inside Your Body book together – we love this book! 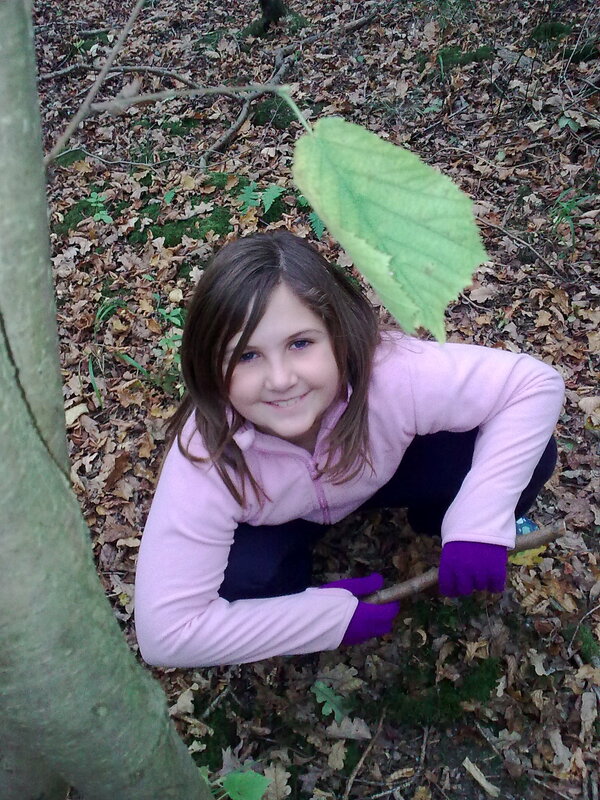 Skye was invited to her friends for a couple of hours and we had planned to take the girls to the woods in search of hazelnut shells to identify whether or not dormice live there. 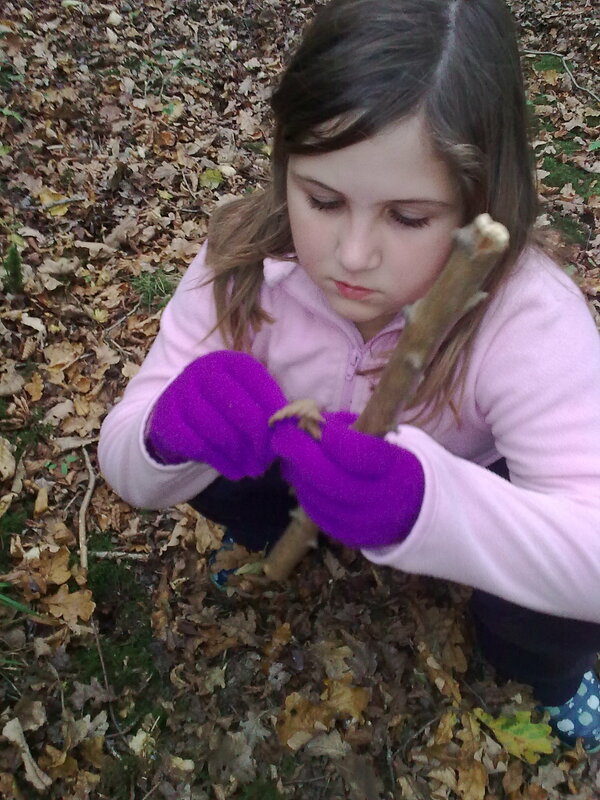 This was prompted by watching BBCs Autumnwatch programme and then logging onto the Woodland Trust website, printing off ways to identify which woodland animal has been nibbling at the nuts. 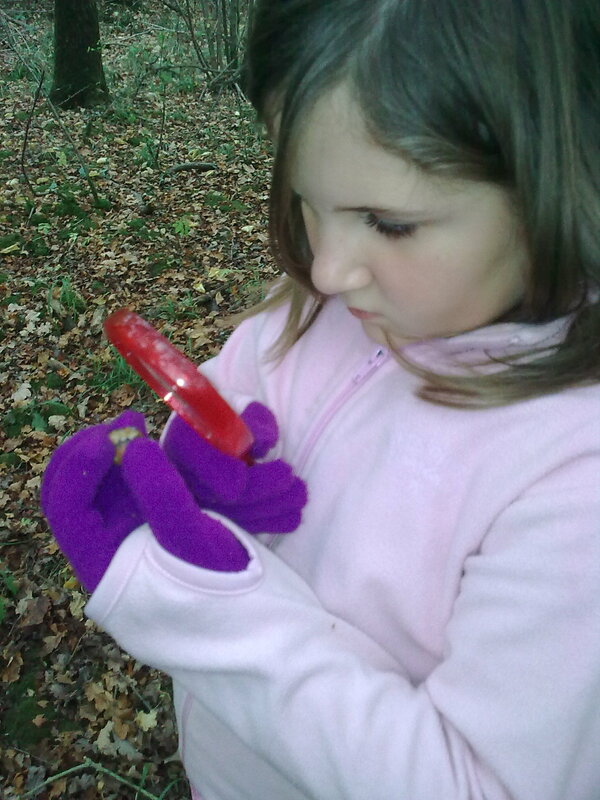 We found many nutshells, mostly hazelnuts and acorns and we believe that they may have been nibbled by dormice when comparing to the sheet we had printed off. 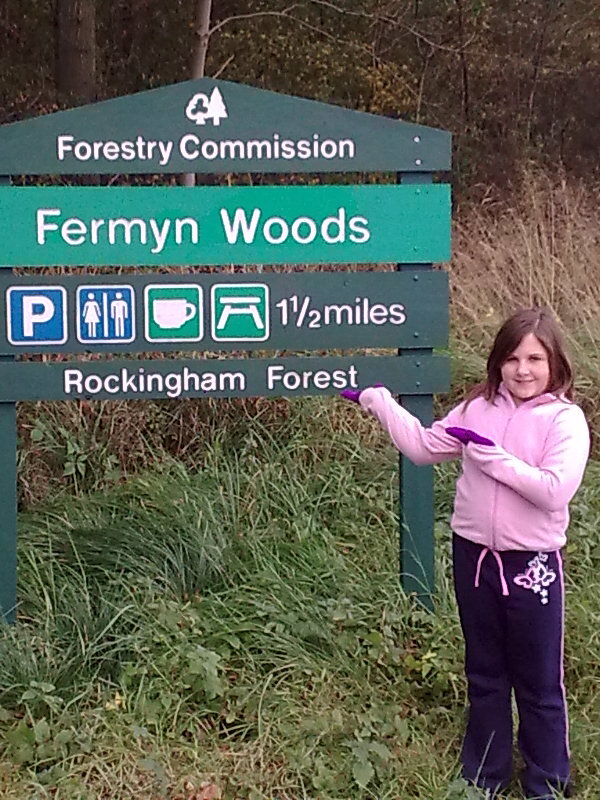 We thoroughly enjoyed our woodland walk and there is so much information on the Woodland Trust website – sheets to identify things such as fungi, berries, trees, birds and insects so will definitely be revisiting that site to make our future walks more interesting! Flicking through a science workbook, the girls came across the topic Life Processes and Living things. They happily sat and completed the tasks within it which prompted many discussion topics on broken bones, teeth, how muscles work and which muscles they use demonstrating various gymnastic and dance skills. All this talk of teeth has reminded me that I need to book the girls a dental appointment, which Skye was not looking forward to as she had wobbly tooth for well over a year and the dentist had threatened that on the next visit if it was still there she would help it out!! Thankfully the tooth came out a couple of weeks ago and Skye got her well deserved £2.00 from the tooth fairy!! So the visit to the dentist is now a little less daunting!! Poppy used the internet to initially find a picture of a cartoon skeleton but found one that you have to fit together so printed this out instead. This helps me to sit! That helps me live long! I thought it was rather good and I think Skye was suitably impressed with her efforts! Inspired by a poem she read last night and playing with her cat, Oscar! Poppy did some lovely illustrations to accompany her poem – playful cat and a lazy dog!! I love that they are different – Skye sticking with the task in hand seeing things through and Pops starting with the task in hand but somehow always manages change her course to somewhere completely new and different but usually involving animals!! By the time Merry came back it was time to take Skye and Fran to jazz and Josie to ballet….where does the time go?? On our way home from being out and about this morning, Poppy noticed an RSPCA van and a lady with a rather large net lurking around the brook opposite our house. No sooner had we parked up, the girls had dashed over to see what was going on, as being an RSPCA van, it had to involve animals!! Unfortunately a duck was very badly injured but was avoiding being caught so the RSPCA lady had to call for back up! Whist back up was arriving, they came home to put on their wellies as they were told that extra pairs of hands might be necessary to round up the duck so they could get a closer look. Some 10 minutes later, help arrived…Mark (the RSPCA man) put on his waterproofs and waded into the water to attempt the rescue. By this time the duck was completely exhausted and probably realised that it was not going to escape ‘the net’ and so didn’t put up much of a fight. Upon inspection, the wound to the ducks back was rather gruesome, they suspected a dog or a fox may have attacked it. The girls watched as the poor little duck was painlessly put to sleep. The RSPCA inspectors were very keen to answer the girls questions and, after finding out that Poppy would like to be an RSPCA inspector, gave her some vaulable advice….that to do the job, more importantly than to love animals, she needed to be able to get along with people from all walks of life, in his words, posh, not so posh, tall, short, big, little…A good idea would be to get a job as a volunteer somewhere that she would have to deal with the public. Due to lack of sunshine on our summer holiday in Cornwall this year, we felt we needed another break! We booked 5 nights in a mobile home on a site about an hour from Paris. We were so lucky with the weather, there was not a cloud in the sky for the duration of our stay and temperatures were consistently in the mid-20s! The site was very quite, being outside the school holidays, which was great as Skye and Poppy we able to use the slides in the pool to their heart’s content – and even managed to perform some aqua-gymnastics!! We had some lovely walks into the village. We spent one day in Paris…parked close enough to the centre, with the help of Sat Nav, to use the Metro. When we emerged from the underground, the first thing we saw was the Arc de Triomphe. We decided not to spend any time here as we had a long busy day ahead of us, but got at least one photo for the album. We then headed straight for the Eiffel Tower, once there, girls were amazed at the size of it and were surprised how far the legs were apart! Skye and Poppy were quite optimistic about climbing the steps of the Tower and had planned that we would easily get to the second floor – the reality was that we only managed the first floor – it was quite hard going on a warm day!! But saying that, the views were fantastic. We spotted many of landmarks – The Sacre Coeur, The Seine and Trocadero Square. The girls found out, from some of the interesting facts displayed, that in 1989 Philippe Petit tight rope walked from the Eiffel Tower over the Seine to Trocadero Square which is 700 metres across!! I felt woozy walking to the first floor!!! They also found out that the oldest elephant in the world (85 years old) was led up to the first floor of the Tower! After all this excercise, we had our picnic in the park at the foot of the Tower, which had a huge family fun day going on promoting healthy living so lots of dance displays and activities to try out. After we had seen the Pompidou Centre and admired the architecture of the Notre Dame, we chose to relax in the Parc de Luxembourg which is a huge, beautiful park and gardens – hard to believe it can be found so close to the hustle and bustle of this vibrant city! It was a Sunday afternoon and it was packed – a band was playing in the band stand, many people were relaxing with friends or a good book, even participating in a chess tournament! There were may fountains and statues with the centre piece being the Palais de Luxembourg. We sat together and used our guide-book to find out its history and discovered that it is currently the home of the French Senate – that would explain the armed guards patrolling it!! We will definitely go back to Paris again next year and hopefully spend a few more days sightseeing. Although we do not watch BBC’s series, ‘Merlin’, we were staying about 10 minutes from the fantastic Chateau that it is filmed at. We took a leisurely drive to it, not really knowing what to expect…but WOW!! It was spectacular – probably the best Chateau we have visited on our frequent French holidays! Unfortunately it was closed on Mondays, which is the day we chose to go, but we were able to walk around the grounds. Absolutely beautiful, again another place we will take time to revisit. Our French trip has inspired me, again, to brush up on my French language – I have been encouraging the girls to incorporate this as part of their daily visits to Education City!